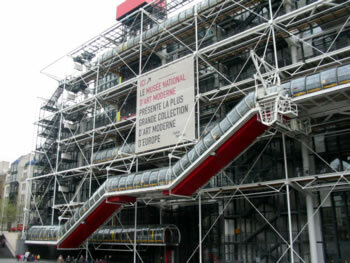 We spent much of the day wandering through the Centre Pompidou, exploring the vast spaces and vast collection. The building's not new anymore -- it must be nearly twenty -- but it's stood up remarkably well. Not just in terms of the general shabbiness that sometimes creeps up on modern architecture, but also in terms of the way the building still reads as new, exciting, and sensible. Moving all the circulation to the exterior was a stunt, yes, but it does leave you with huge, uncluttered spaces. A show of newly-commissioned Dionysiac art left me completely cold. This was fun to discuss in college, sure, but I'm not sure these works teach us a lot that we didn't figure out back then. The real gems, of course, are the vast rooms of wonderful early moderns. It's amazing to see how quickly people picked up Cubism. 1912 must have been an interesting year.